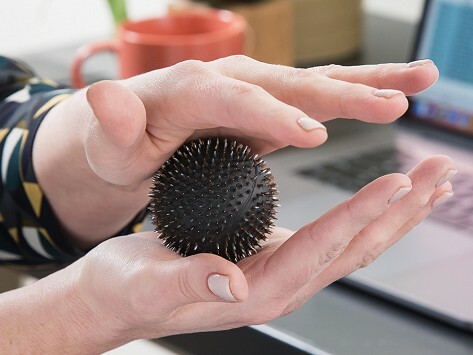 Rolling or squeezing this metal-spiked acupressure ball is thought to create a warm, revitalizing effect and can stimulate circulation, aid in recovery, and enhance physical and mental performance. The metal spikes make this ball a sturdier, more authentic stand-out that pays tribute to traditional acupressure therapy tools. I really like it. I keep by computer chair reaaly releives tension. I use it for my hands and feet, has a nice feel , it is a very relaxing tool. Paul de Jersey was inspired to create his Akuspike therapy tools when he used an acupressure mat during recovery from a back injury. He teamed up with Dr. Nikolay Lyapko, a Ukrainian acupuncturist and sports therapist, to make a new take on the traditional pieces used for centuries and to make this ancient form of therapy more accessible to modern folks. Pressure from Aku Ball and Aku Mat’s metal spikes against skin is believed to trigger a healing response in the body that feels warm and revitalizing and can stimulate circulation to enhance physical and mental performance. The metal spikes are a traditional—and deliberate—touch. The metals are ones found in the body, like silver, zinc, and iron. Fitting in a squeeze or roll with the Aku Ball is easy and you can do it when you’re just about anywhere. Aku Mat has a higher-intensity level, but it’s the same idea: lay, roll, or stand on the metal spikes. It looks intimidating, but those of us who tried it enjoyed it. And you can do it for as long as it feels comfortable and build up your practice over time.